At the closing of the High Level Policy Dialogue on Investment in Agricultural Research for Sustainable Development in the Asia-Pacific Region, Mr. David Shearer, General Manager, Corporate, ACIAR and Dr. Raghunath Ghodake, Executive Secretary, APAARI, shared their reflections on the two-day event and presented the way forward. 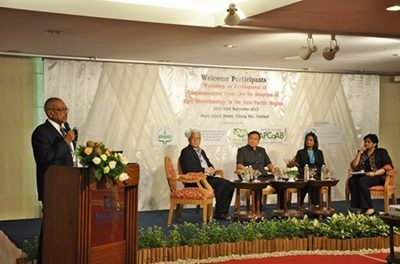 The inaugural address by Dr. Sakchai Sriboonsue, Deputy Permanent Secretary, Ministry of Agriculture and Cooperatives, Government of Thailand, challenged over 130 key stakeholders participating in the event to provide a roadmap to mobilize resource in attaining the Sustainable Development Goals (SDGs) within the Asia-Pacific region. The resource mobilization would take place through innovative systems where governments are better equipped to meet the challenges of today and tomorrow. Building on the Millennium Development Goals (MDGs), the United Nations has adopted a new 2030 Development Agenda titled “Transforming our world: the 2030 Agenda for Sustainable Development”. The 17 Sustainable Development Goals (SDGs) and 169 targets that balance the three dimensions of sustainable development: the economic, social and environmental, will guide action to end poverty and hunger, protect the planet, ensure prosperity for all, foster peace, and mobilize partnerships. With agriculture being the common thread holding the SDGs together, this new universal agenda sets and important direction for the future of agricultural research policies, agri-food research and innovation systems, programmes and funding in the region. Dr. Raghunath Ghodake urged the participants to ensure that the outputs from the dialogue were able to go forward and make a substantial contribution to the SDGs in the region. Two of these SDGs are the most relevant to the Asia-Pacific region as well as the work of APAARI. SDG 2 calls specifically to “end hunger, achieve food security and improved nutrition and promote sustainable agriculture”. SDG 12 on sustainable consumption and production focuses on reducing food losses and waste through more sustainable pre- and post-harvest practices – another area of importance for APAARI. 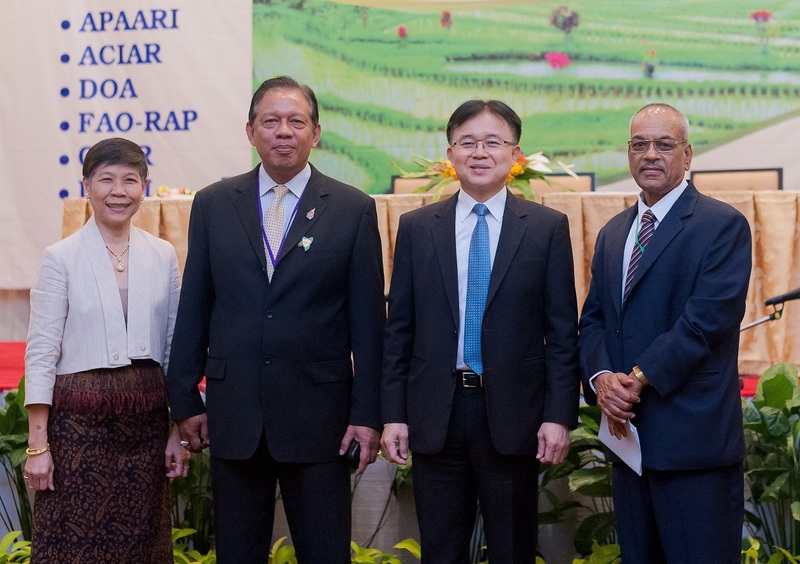 Dr. Somchai Charnnarongkul, Chairman of APAARI and Director General, Department of Agriculture, Government of Thailand, pointed out that this can only be achieved if we are able to effectively work together to reduce hunger and poverty in the Asia-Pacific region. Today, agricultural research is challenged by the need for greater investment to feed more than 9 billion people by 2050 and ensure the well-being of future generations in a manner that reduces pressure on the environment and underpins economic growth. However, as reminded by the Ministry of Agriculture and Cooperatives, Government of Thailand and the Asian Development Bank (ADB), all of this is happening in the very complex Asian setting, with high rates of growth and the region that is evolving rapidly technically, socially and environmentally. Rather than only seeking additional funding, agricultural researchers have to demonstrate effectiveness in implementing programmes and activities – the focus should be on both quantity and quality of research investment, not on funding alone. Climate change is adding increased complexity, as is the rapid growth of obesity in the region, making adaption more difficult and long-term investment more risky, but also raises the bar in terms of need. In this environment, the nature of agricultural research must change. Instead of focusing on producing more tonnes of what has previously been produced, it must be about the ability to meet the future demands – meat, fish, fruits, vegetables, all delivered to fulfil consumer requirements in view of future environmental concerns. This also requires investments in capacity to create and use new knowledge to facilitate mass innovations, and manage the flow of information to deliver impacts. Agriculture also needs to be profitable with the smallholder farmers remaining the key focus. Women have become even more critical in agriculture and need to be addressed effectively. The youth that are disappearing from agriculture need to be retained. In view of this, research in agriculture needs to be gender sensitive and attract youth for agriculture to effectively address the issues of sustainability. As agricultural research changes to address the issues of sustainability more effectively, innovation is becoming central to the agenda with new ways of doing things and in different partnerships than before. Dr Karin Nichterlin, from the Tropical Agriculture Platform (TAP), provided an insight to innovation as “to draw innovation out, you must bring stakeholders in”. The role of the private sector needs to be enhanced and paradigm in the funding and delivery mechanisms for agricultural research needs to shift. It is important to work together to continue to deliver benefits to smallholder farmers. Dr. Kamal Kishore from the Rainfed Livestock Network (RLN), Kullu, Himachal Pradesh, India, encouraged the participants to shift their thinking from lab to land and make it land to lab, which would require a very different approach to priority setting and lessons learnt. Various models exist to support this partnership development. For example, the TAP provides a sound framework of commitment, vision, capacity needs assessment, strategy and implementation, all underpinned with its monitoring and evaluation (M&E). However, different countries are promoting different approaches on the ground. Clearly, the future plans of each of the countries should focus on innovative partnerships, including South-South Cooperation, collaboration with China and India, as well as with the CGIAR, the health sector, and ASEAN. With changing conditions, cooperation will become more important than competition, and hence there needs to be a focus on the whole system and leveraging new knowledge through connectivity in sharing the economy to have impact. 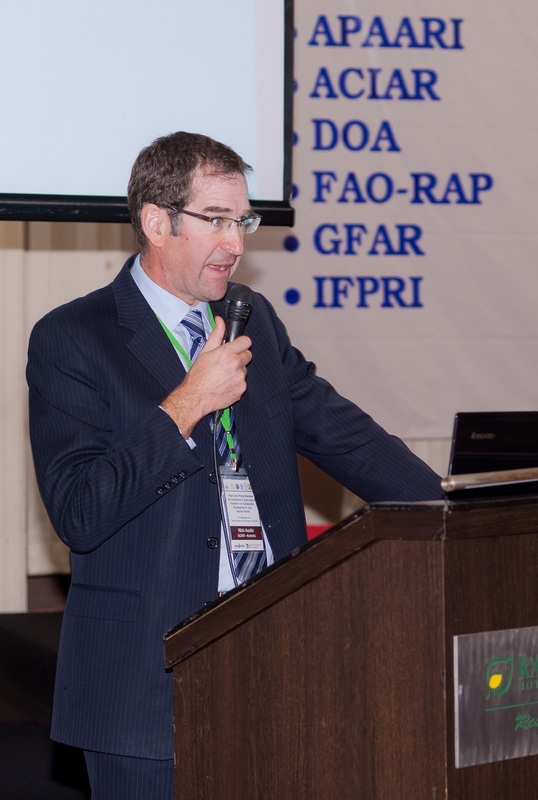 Dr. Nick Austin, Chief Executive Officer, ACIAR, pointed out, agricultural research and innovation can provide a healthy diet for the people in the region. Aid has never overcome poverty by itself, but it is needed to support economic growth, during a time where there has been global disinvestment in agriculture. The aid agenda has changed away from the provision of basic services, to be focused on supporting economic growth, with agriculture and resource management at the top of the agenda. Developing countries themselves are showing that their economies are the key drivers of economic growth, but need to caution against the growth in inequality. In this respect, the private sector is recognized as the engine room of growth. To be able to do things differently, there is still a need for clear, explicit and logical impact pathways that define the delivery of research outcomes through the end users, with the right structural links to development actors. With innovation at the centre of the required thinking, size of the investment does not matter, with a small number of highly successful projects carrying the rest. The targeted research needs clear line of site to impact pathways and the ability to invest in projects that will not show the high rates of return that are crucial. These approaches must serve as lessons. The region needs rapid innovation with well-targeted research, effective communications and incentives for smallholder adaptation, with new cooperation to tackle intractable poverty. How much does Asia invest in agricultural research? Dr. Gert-Gen Stads from IFPRI’s Agricultural Science and Technology Indicators Project (ASTI) asked: “How much does Asia invest in agricultural research?” A simple question that has no simple answer. However, without this basic understanding, policy makers, and advocates of agricultural research as a contributor to productivity growth and poverty reduction, do not have a clear baseline to develop approaches. 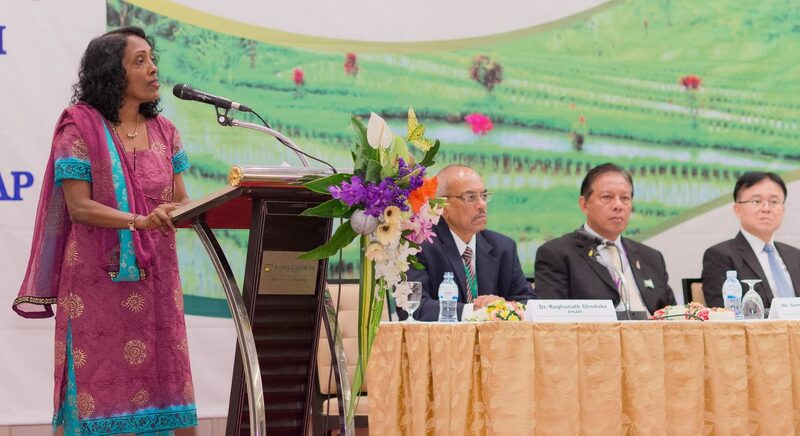 In her Keynote Address, Dr. Kundhavi Kadiresan, Assistant Director General of the Food and Agriculture Organization of the United Nations (FAO) – Regional Office for Asia and the Pacific (RAP) – reminded the participants not to be complacent. Although there is lot of evidence that research raises productivity, delivers excellent internal rates of return (IRR) and has an effect on poverty, the agricultural research intensity (expenditure on agriculture research as % of agriculture GDP) within the region rests with China and India. Elsewhere, it has been on the decline, which does not provide for a positive outlook for addressing key hunger and poverty concerns of the region. Although the data is variable, it shows broad differences in spending. For example, in 2011, PPP China was USD9.4 billion, India USD3.4 billion and Indonesia USD1.4 billion. China is driving the growth of regional spending, which quadrupled its investment in agricultural research from 2000 to 2013. Agriculture research intensity of Malaysia is also high. However, all countries are under what the United Nations (UN) calls for in terms of a 1 per cent target. This significant under-spending that exists in agricultural research in the region needs to be addressed. 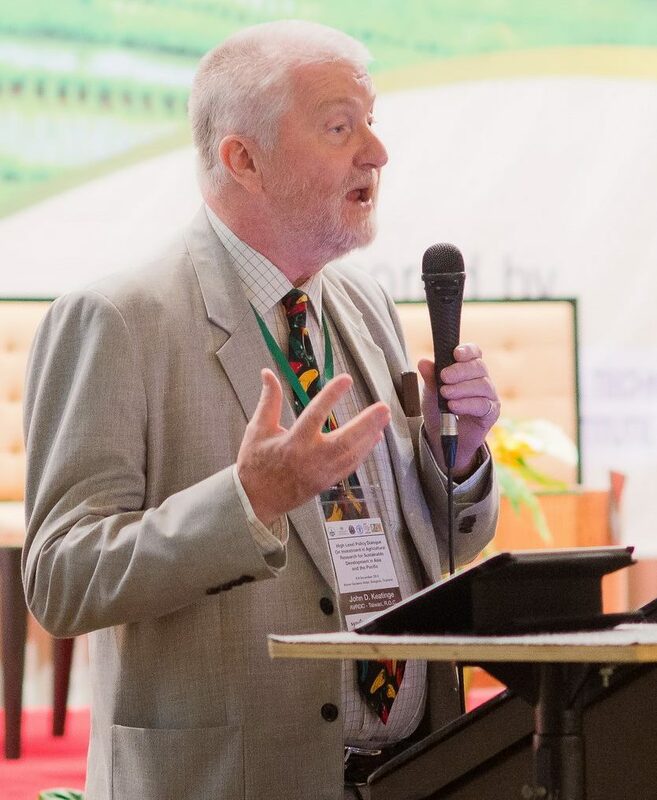 Dr. Allan Bird, Development Consultant, Department of National Planning and Monitoring, Papua New Guinea, raised a question: “Are we using the right tools to tackle the problem?” which is often a difficult question for agricultural researchers addressing poverty. The current funding challenges require the right tools to address the problem. The intellectual property (IP) strategy, for example, is looking to address the change in funding profiles. The private sector can be an important vehicle for funding agricultural research. However, their funding contribution to agricultural research still needs to be understood and addressed. It is important to note that increasing total spending and research intensity, with targets being set to help mobilize resources, should not be end goals. The end goal should be the institutional capacity to maximize benefit of agricultural research. Women smallholder farmers must be central to the agenda, but it should also be noted that women are severely under-represented as agricultural researchers. There is a need for different insights to address the unique issues for women smallholder farmers of the region and related funding. While studies by the World Bank in Viet Nam, show that enhancing productivity might not be the right approach and the focus may need to change to be on farming system sustainability, there is clear evidence that agricultural research has a positive impact on agricultural productivity, which has an effect on reducing poverty. Analysis by Professor Peter Warr, Australian National University (ANU) shows that 1/8th of the observed decline in poverty in Indonesia is attributable to agricultural research, with 4.8 million people now being non-poor due to agricultural research. Although the internal rates of return for agricultural research are excellent, this also indicates that there is massive under-investment in agricultural research. Therefore, one of the success factors, or performance indicators, should be a reduction in the internal rates of returns of agricultural research. 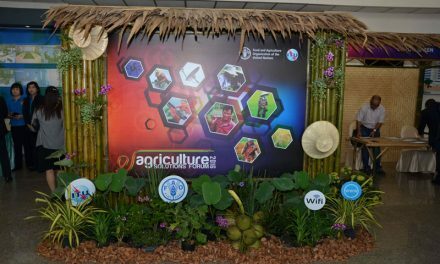 A key reason for the success in Indonesia is that the taking of research output from the international environment, such as that created by the CGIAR, to Indonesia is highly productive. This high rate of productivity of taking international outcomes into domestic impact needs to be continued and encouraged. 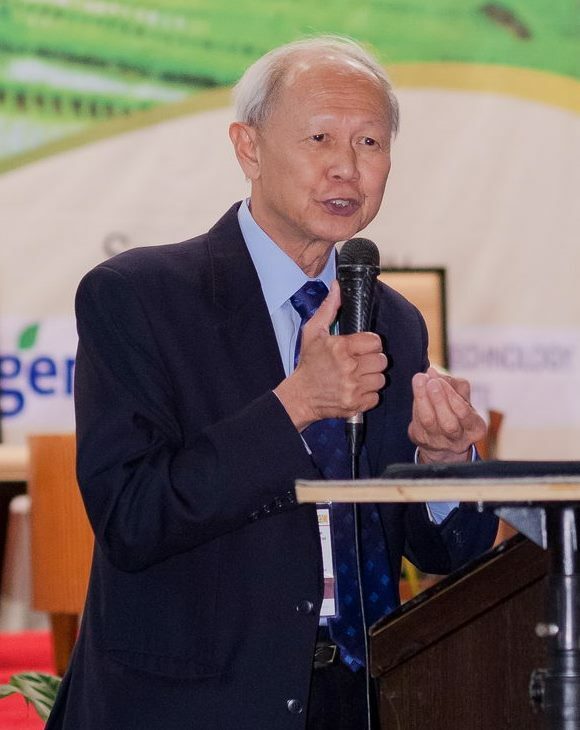 However, there are institutional problems with the lack of engagement between research and development actors within the region.Agri-biotechnology products have demonstrated value in their ability to narrow yield gaps and contribute to manage post-farm gate losses, which are two key R&D challenges. Dr Paul Teng, Principal Officer, National Institute of Education, Singapore, proposed an approach centered on “Research for Entrepreneurship” where there is a need to create the space for “Freedom to Operate”. The International Livestock Research Center (ILRI) also demonstrated the under-investment in livestock and fish, as well as their critical role in food security and livelihood improvement. The very strong market demand in livestock and fisheries is having a substantial impact on the dynamics of the sector, whereas there is not the same market dynamics in the vegetable sector. Obviously in these two different situations, different policy settings are needed to support change.Dr. 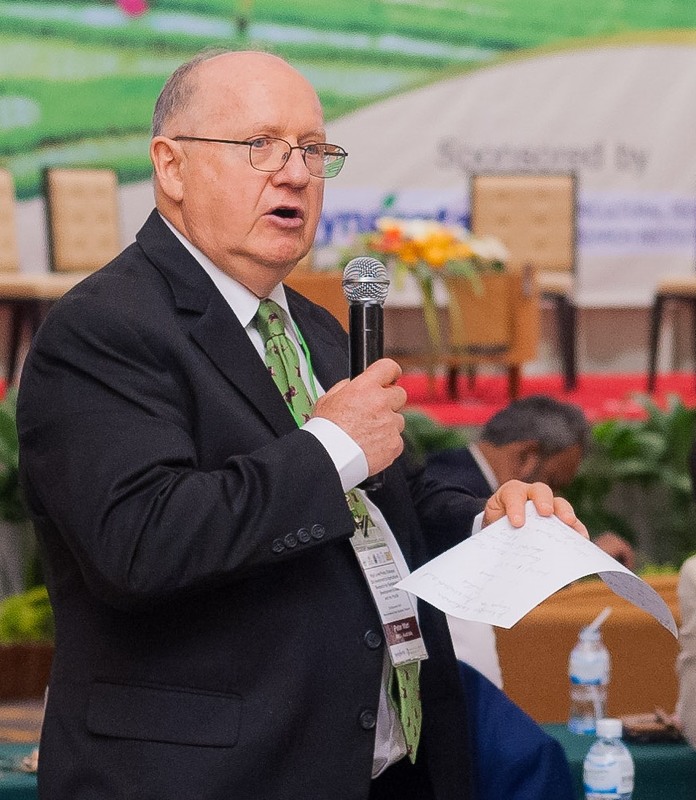 Dyno Keatinge, Director General, AVRDC – The World Vegetable Center, encouraged the participants to think beyond Green Revolution to have a more balanced investment portfolio to support the production of nutritious food. There is a need to focus on healthier diets with vegetables being central to such diets. Smallholder farmers need to be given the chance to come out of poverty, with the ability to create jobs and reverse the flow of the youth to city. Women, Income and Nutrition (WIN) is a concept to benefit women by creating a WIN-WIN situation combined with the importance of working together, Inclusiveness and National Agricultural Research Systems (NARS). The discussion on knowledge management (KM) provided an insight from government, a not-for-profit and a commercial actor. Presentations highlighted the use of data, with novel and innovative tools to have impact at different levels, the highly specific data for appropriate land and water management in India, CABI’s PlantWise platform and the Rice Bowl Index. This diversity demonstrates not only the range of actors that operate in this space, but also the importance of effective knowledge transfer in achieving impact for different stakeholders with different performance indicators and requirements. To achieve positive impact, there is a need for effective communications and the capacity to effectively communicate. A key aspect of effective communication, particularly at the smallholder farmer level, is the trust. While researchers trust in the published data and knowledge, farmers have different trust boundaries, and different avenues to gain trusted information. This needs to be taken into account for effective communications. To build these trusted relationships, participation of smallholder farmers in not enough as there is a need to create an environment of engagement, where the communication approach leads to the engagement in the right relationship. In exploring KM, the opportunity that this critical area presents in making agriculture more attractive to the next generation and long-term impact, has become apparent. Models are being developed, like in the Philippines where students collectively run a farm and in the process become better students. Furthermore, greater efforts need to be made to engage the youth in agriculture, and more importantly in agricultural research. 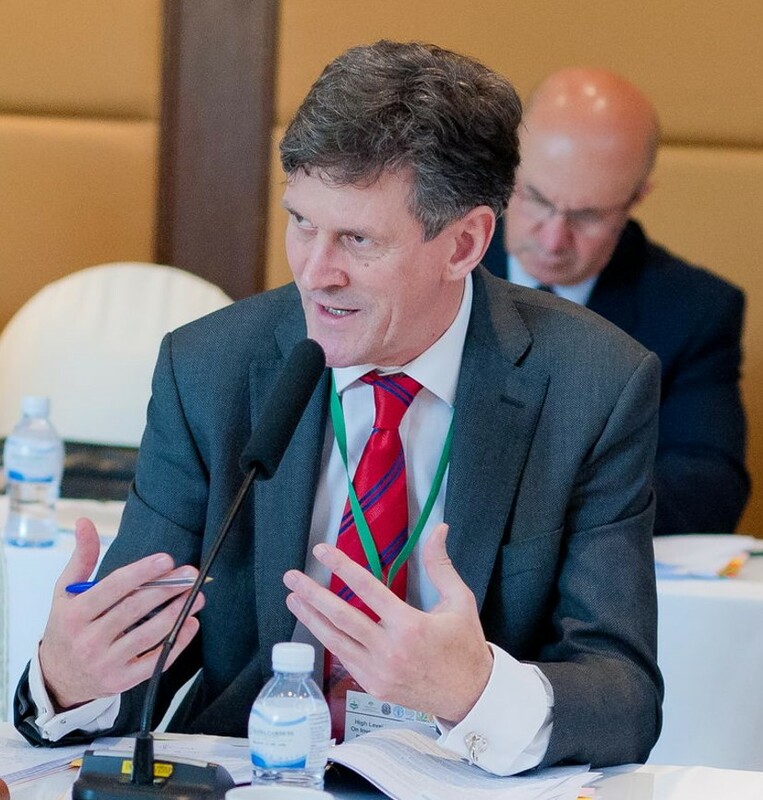 Innovation needs to be central to a new paradigm – Innovation needs to look past the products of the Green Revolution into research that supports a nutritious diet, but also innovations in partnership – with the private sector, not for profits, regional, South-South, but importantly partnerships with women and youth. However, innovation comes with risks, which requires the freedom to operate in this risky environment, where a small number of successes, are the successes of the whole system. Data, information and knowledge is power – Without the right understanding of baseline issues, such as research intensity, decision making is difficult. However, data, information and knowledge are not enough. Trusted partnerships and recognition that we are part of the knowledge continuum are needed to use this to support economic growth and have impact on poverty reduction. Impact is the end game and capacity building is the legacy– Research leads to productivity gain and reduces poverty as long as we understand impact pathways where performance and delivery of these pathways can be achieved in the most effective way and can build long-term capacity. Greater investment in agricultural research and innovation can feed more people – By 2050, more than 9 billion people will need to be fed. 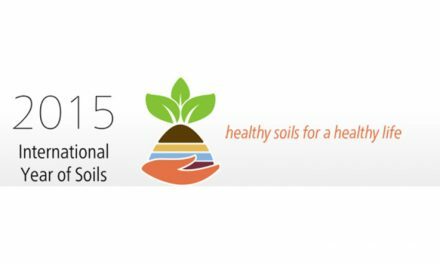 This calls for greater investment to ensure food and well-being of future generations. The massive under-investment that exists must be addressed to improve the agricultural research intensity that can address key hunger and poverty concerns in the Asia-Pacific region. The nature of agricultural research must change to address sustainability more effectively – Rather than only seeking additional funding, agricultural researchers have to demonstrate effectiveness in implementing programmes and activities – the focus should be on both quantity and quality of research investment, not on funding alone. Reducing hunger and poverty in the Asia-Pacific region requires different partnerships – As agricultural research changes to address the issues of sustainability more effectively, innovation is becoming central to the agenda with new ways of doing things and in different partnerships than before. Agricultural research has an impact on agricultural productivity – While enhancing productivity might not be the right approach and the focus may need to change to be on farming system sustainability, clear evidence demonstrates that agricultural research has a positive impact on agricultural productivity. For example, agri-biotechnology products have demonstrated value in their ability to narrow yield gaps and contribute to post-harvest management. Self-sustaining governance and resource mobilization for APPARI. Both these thrusts are complementary and synergistic to each other. Figure1 below shows APAARI’s key implementation focus areas and their relationship, especially with the specific thrusts among the different thematic thrusts that form the basic structure of various steps and action under the way forward. The end of the Policy Dialogue has begun a new process of steps, collective actions and partnerships in the ‘Way Forward’ towards realizing the SDGs in the region. 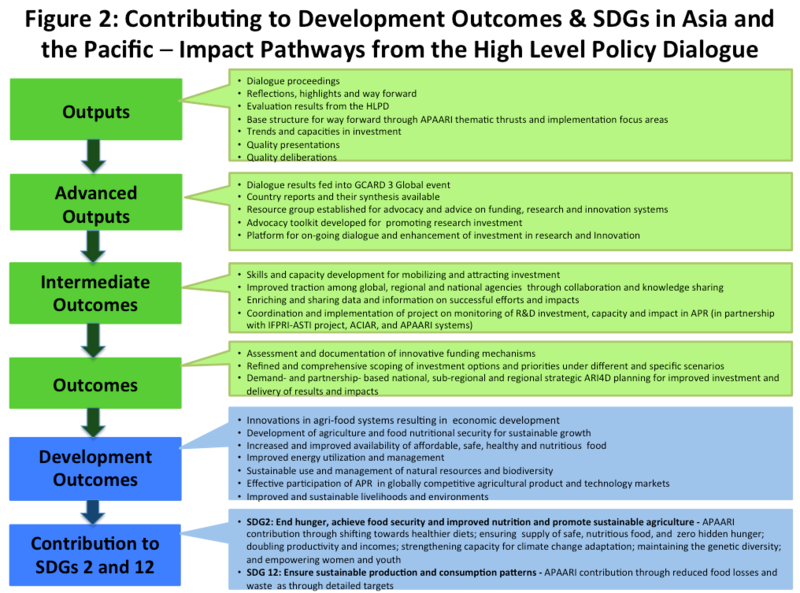 The impact pathways have been developed as planned outputs and outcomes from the Policy Dialogue that are shown in Figure 2 below. These outputs and outcomes form the basic building blocks of the way forward and are described below. 1.1. Dialogue proceedings: The proceedings will cover the dialogue’s deliberations, inputs and outputs, efforts, assessments and perspectives; as well as the key recommendations and a statement of way forward actions and pathways. 1.2. Dialogue reflections, highlights, recommendations and way forward statements: Immediate outputs will be in terms of the dialogue highlights in a narrative form and follow up actions as expressed in the Way Forward statement. 1.3. Evaluation of dialogue’s results: The results of evaluation of the dialogue, based on responses of the participants through specific evaluation sheet, and various other responses, such as through social media, will also be made available. 1.4. 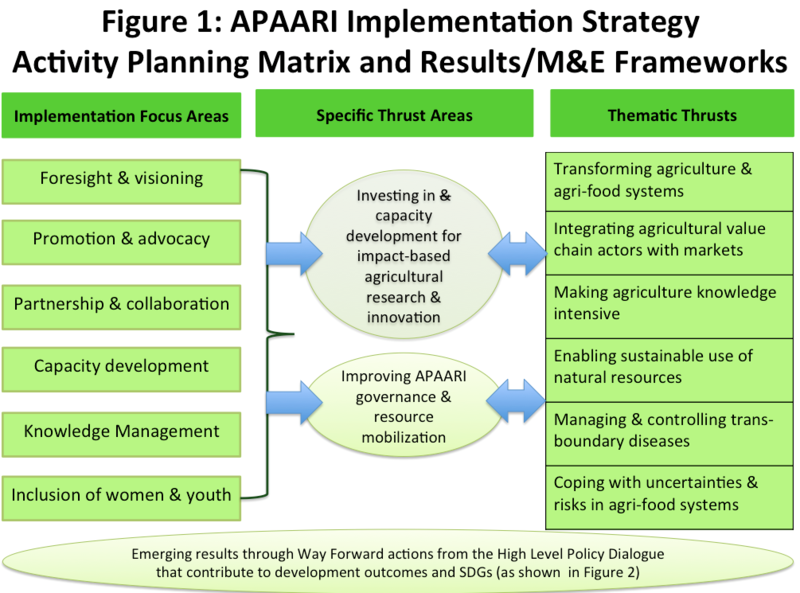 Base structure for the Way Forward through APAARI strategic thrusts and implementation focus areas: APAARI’s recently developed Vision 2030 includes some key thematic thrusts along with its implementation focus areas (ref. Figure 1 above). 2.1. 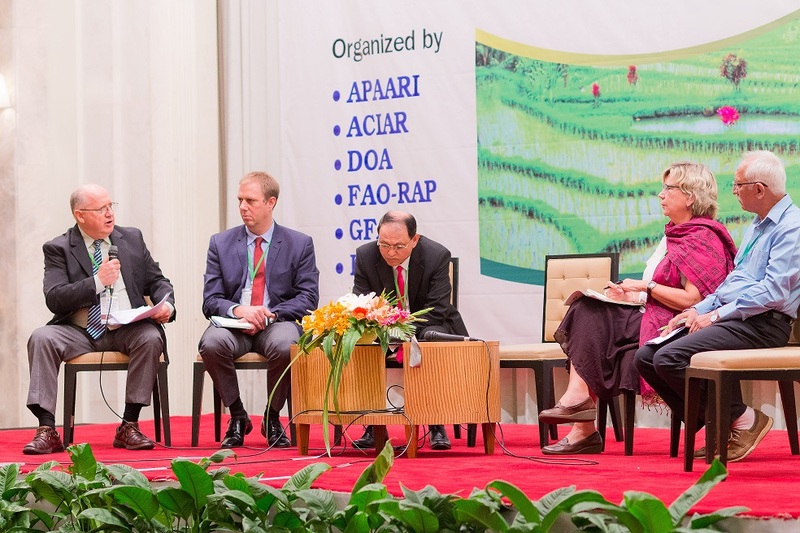 Dialogue results fed into GCARD 3 Global event: The inputs to and results obtained from the dialogue, as reflected in the dialogue proceedings, will be fed into the regional and global events of the CGARD 3 process, being undertaken in partnership between GFAR and CGIAR. This being the national, regional and global platform for addressing and chalking out future plans and processes, the enriching experience of this unique policy dialogue needs to be shared for further enhancement of the Way Forward not only in the Asia-Pacific region but also globally. 2.2. Country reports and synthesis paper refined for an independent print: Soliciting country reports from 22 countries in Asia and the Pacific and distilling the results into a Synthesis Report for the region, has itself been a pioneering effort in painting various comparable and unique scenarios, as well as in laying the foundation for baseline data, information and knowledge as part of knowledge continuum. These efforts need to be consolidated through refinement of country reports and synthesis paper through independent print. 2.3. Resource group established in the Asia-Pacific region for advocacy and assistance: The area of enhancing and improving investment, getting policy support and generating an enabling environment will require highly skilled group of experts or a resource group that should be able to provide objective advice on funding, research and innovations systems in the region. They can cover various areas, such as policy, strategy, investment structure, reengineering and structure. Such groups can be easily available based on the needs, demands and partnership of national, sub-regional and regional systems. 2.4. Systematically developed advocacy toolkit for structured application: By considering various dimensions of enhanced and improved investment in AR&I for sustainable development in Asia and the Pacific, there is a need to have well-equipped and developed skills and capacities as part of the advocacy toolkit available in the region. Key dimensions to be considered in arriving at recommendations on strategies and options of enhancing and improving investment include: type and kind of investment; policies, priorities, specific needs, internal and external scenarios of decision-making systems on investment; regimes, options and scoping of investment; skills and capacities among research and innovation systems to be invested in; attractiveness of returns to investment; and alternative development options available for investing the limited resources. Therefore, the advocacy toolkit needs to be equipped with such methodologies and approaches to address the assessment of these key dimensions in helping facilitate appropriate recommendations to both the systems making investments and the systems needing investments. The advocacy toolkit may include basic tools that can be generic in nature and applicable on a universal basis while there will also be applied tools that can be modified and used in specific cases. Once developed and validated, such advocacy toolkits, as supported by an appropriate resource group, can be used based on demand and partnership arrangements. 2.5. Platform for on-going dialogue and enhancement of investment in research and innovation: To ensure a continuum and consistency of efforts to enhance research investment, an on-going dialogue targeting different scenarios and applicable at different scales, will need to be established and supported at the regional level. Such a special platform can look at foresight and visioning, emerging challenges and opportunities, as well as resource mobilization for supporting the platform initiative. 3.1. Skills and capacity development in mobilizing and attracting investment: Based on the impact-oriented strategy and plan, a skill enhancement and capacity development project/programme is implemented for research and innovation organizations in measuring up to accountability, and attracting and mobilizing investment. The areas can include: (i) planning, prioritization, M&E, and outcome and impact assessment (both ex-ante and ex-post); (ii) good science, innovations, partnerships; (iii) creating congenial internal and external environment, prudency, transparency and accountability; and (iv) improved ways of smallholder farmers’ participation in ARI4D. 3.2. 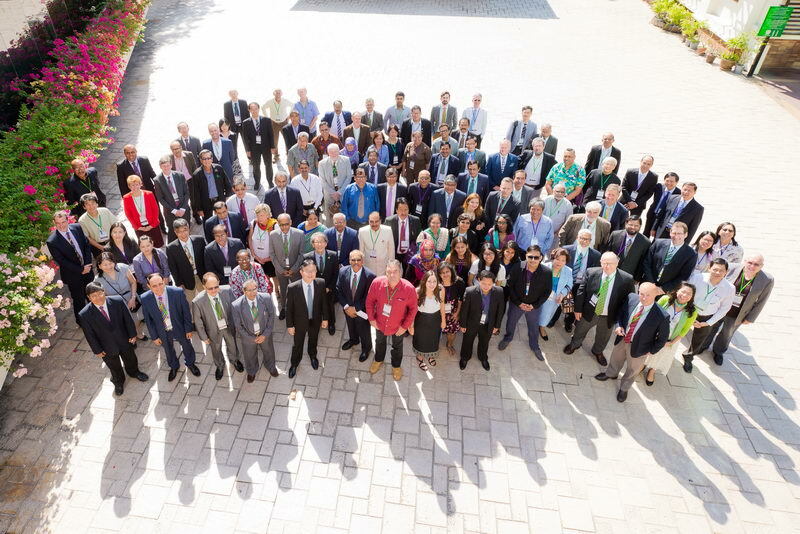 Improved traction among global, regional and national agencies through collaboration and knowledge sharing: Efforts for mobilizing improved investment by research and innovation systems will need to be synergized through closer collaboration with global, regional, sub-regional and national agencies. Some areas can include: knowledge sharing, databases, methods, tools, and successful case studies; as well as partnership, collaboration and assistance to research/ innovation and funding organizations. 3.3. Enriching and sharing data and information bases on successful efforts and impacts: Another core area is to generate and share adequate data and information on successful research and innovation efforts, and results and impacts within and across the region. This can be done through the development of compendium of such efforts, which can be effectively shared amongst various stakeholders as per their needs and requirements. 3.4. Coordination and implementation of a project on monitoring of R&D investment, capacity and impact in Asia and the Pacific: The purpose of this project with expanded coverage, training and in-country implementation, is to reduce the knowledge and information gap on the performance, inputs, and outcomes/impacts of agricultural research and development (R&D) systems in Southeast Asia and the Pacific. Improved knowledge will assist policymakers and research managers to better manage agricultural research institutions, improve imbalances among research staff, enhance research prioritization, and improve the allocation and mobilization of research program funds. This project is proposed as a partnership initiative between, the Agricultural Science and Technology Indicators Project (ASTI) of IFPRI, ACIAR, APAARI and countries in Asia and the Pacific. 4.1. Assessment and documentation of innovative funding mechanisms: Innovations in funding mechanisms/mobilization for improved investments comprised of innovative approaches, policies and strategies can include:(i) various policy initiatives and long-term planning; (ii) the ‘why’ and ‘how’ of joint public-private and community co-investment; (iii) public funding for out-of-the box ARI4D; (iv) cost and benefit sharing, incentives, rewards/awards; (v) case studies, experiences and successful examples; (vi) future collaborative ARI4D efforts among CGIAR consortium and regional NARIs/NAROs vis-à-vis investment mobilization needs; (vii) funding agency and research establishment relationships: obligations and joint intellectual property management; and (viii) policy perspectives and road map for mobilizing ARI4D. 4.2. Refined and comprehensive scoping of investment options and priorities under different and specific scenarios: Besides the dialogue’s limited coverage of scoping investment in the areas of addressing future challenges, smart and sustainable agriculture, partnership for sustainable agriculture and knowledge for sustainable agriculture, other vast areas need to be considered for developing comprehensive investment scoping options and priorities. These could be both generic and specific to various needs and scenarios. 4.3. Demand- and partnership-based efforts in national, sub-regional and regional strategic ARI4D planning for improved investment and delivery of results/impact: Based on the above steps, actions and preparations, and as major step in way forward, efforts will be made in helping and assisting research innovation programs in strategic ARI4D planning for both improved and effective investment and delivery of results/impacts. The basic consideration will be demand-driven and partnership-based effort at the sub-national, national, sub-regional and regional levels. The results of the High Level Policy Dialogue are just the beginning as APAARI sets to develop its first Strategic Plan for 2017-22 under the renewed Vision 2030. Its thematic thrusts and implementation focus areas will guide APAARI as it sets out on the path towards contributing to the realization of SDGs in Asia and the Pacific.